This book sounds good and like something I'd enjoy. If you like it, I'll probably like it. I've been thinking of buying this for the excruciatingly long flight- now I definitely want it! I loved this book an have been meaning to write a review. It's a thoughtful and beautiful book. I highly recommend it! You can also find Priscilla Gilman on Facebook, where she will answer any of your questions. 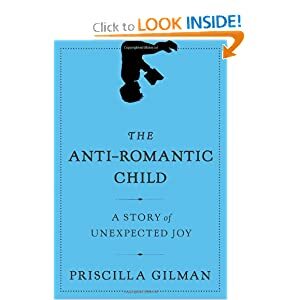 I follow Patricia Gilman on FaceBook and have read some wonderful things about this book. I am childless-by-choice, but know three families with "autistic delights" and know the challenges. I know this book had helped two of those others. I hope I win it - I can read it and then pass it on to the third mother! I am the mother of 3, 2 of which are on the spectrum. Often day to day life is a major challenge. I would love to read this book, I could always use more insight to help me understand why and how. Can't Wait to read it, it will be very beneficial. I'm following you. Would LOVE to have your book. I will NEVER forget the day I realized that my grandaughter was probably autistic. She had taken the coasters from the living room to the dining room to play. She was about a year old. I went to check on her & she had lined them up in a straight line..coaster, baby bottl, coaster bby bottle, coaster....Scared me to death. She is now 6 yrs old & STILL does this. Have a pic of here lining up her french fries before she eats them. Letting go of expectations for our children is terribly familiar to me. An an educated woman with high hopes for my children's aspirations, I struggled- with the loss of my hopes for my child, but mostly I struggled with myself. Learning to love my child where he was, though he didn't match the ideal of what I thought I was in love with. He turned out to be better than perfect & exactly what I needed in my life to help me transition & grow as a person. I look forward to reading another woman's experience on her own journey. Thanks for the opportunity to win this book! I must have this book. I'm a grandmother to a wonderful special needs child. I can't wait to read it. This year was the first time that I worked with special needs students. It was one of the most rewarding things I have done. I also gained so much insight into humanity and people. Every time I would feel low, I would meet up with the kids. There is something special about them that shines. My best friend just read this and told me I really needed to get my hands on it. Glad to hear another ringing endorsement, I've gotta add it to my reading list!